Lucasfilm and Disney are keeping any potential Star Wars: The Last Jedi spoilers close to the chest, but people can't help but talk in light of a new image from Hungarian film magazine Cinemania Mozimania. It shows Luke in dark, tattered robes and what looks like the Star Wars universe equivalent of a rain poncho. I doubt anybody would disagree with the assessment of Luke as a broken man. Once a proud and noble leader in the Rebellion and paragon of the Jedi Order (or at least what remained of it), he's been in hiding since his pupils were killed by one of his own and, if the first trailer is anything to go by, no longer believes in the Jedi code. I'd say this costume reflects that quite well. His poncho (or whatever you want to call it) is a functional accessory given the climate of the planet he's isolated himself to, but even below that we can see his clothing is worn and ragged. And of course, it's all much, much darker than what he was wearing at the end of The Force Awakens. 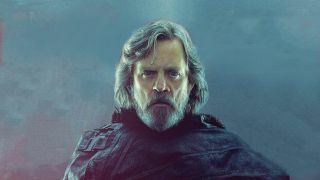 That could partly due to the lighting, but it also lends some credence to the theory that Luke has been dabbling in philosophy and powers traditionally associated with the Dark Side. Previous films have always depicted this interstellar struggle as black and white. Perhaps, as reflected by Luke's wardrobe, The Last Jedi will try to introduce some shades of gray.